It's fun to create new plants from some of your favourites and the easiest way is via stem cuttings. There are different methods depending upon the type of plant you wish to propagate which I have detailed in the table below. 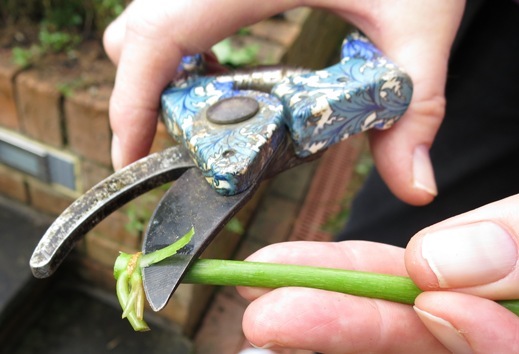 I have also set out a number of simple tips to help ensure success with your cuttings. When collecting cuttings, keep them in a plastic bag and in a cool place as they wilt easily, which hinders root formation. Pot them up as soon as possible. Use of heat below the pot of cuttings will accelerate rooting Can be useful to take a heel of wood from the main stem if a side shoot is used for the cutting. Alternatively, make a wound by removing a 2-3 cm sliver of bark from one side of base of cutting Useful to make a wound by removing a 2-3 cm sliver of bark from one side of base of cutting. When taking the cuttings, cut the bottom end of the cutting straight across and the top on a slant, so you know which way up to plant them! Use clean, sharp tools, clean pots and fresh propagating medium to avoid disease. Use an open and free-draining propagating mix such as perlite mixed with hydrated cocopeat. Firm the mix in the pot before inserting cuttings. Collect your cuttings in the cool of the morning, place in a plastic bag, and don't wait too long before you pot them up. 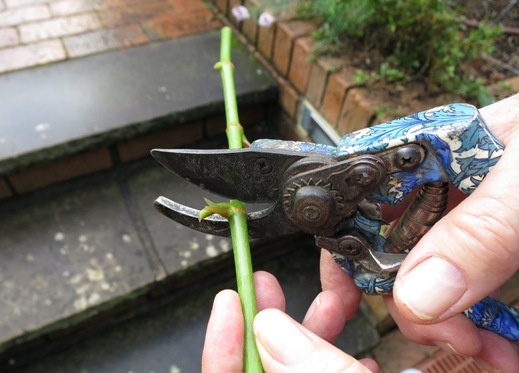 Cuttings are best taken from young, healthy plants - it's harder to get good material from old, woody plants and they won't be so successful in taking root. Avoid flowering shoots if possible when choosing cutting material. If this isn't possible, cut the flowers off before potting up - they will rot and cause disease in the pot of cuttings that may compromise the cuttings. Cut just below a node, as rooting hormones and other stimulants naturally accumulate at the nodes. In the case of some climbers, such as clematis and honeysuckle, however, it can be advantageous to take an intermodal cutting. 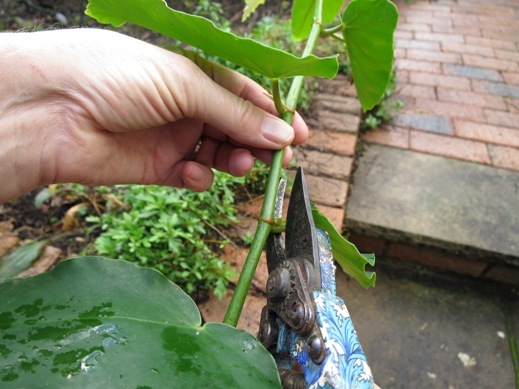 If there are too many leaves on the cutting, remove some of them, making sure base of cutting is clear of leaves; if the leaves are very large, you can cut them in half. This helps reduce water loss. It can be useful to shave off a 1cm long sliver of the top layer of the stem along the side of the cutting at the cut end. This helps to hasten the formation of roots. Once the cutting is ready, dip in hormone powder/gel or honey if you want to use one of these substances to help promote root-formation - but it isn't compulsory! Use a pencil or skewer to make the hole in the propagating mixture so that you won't damage the stem and so that your honey or hormone mixture doesn't rub off on the way in. Place cuttings around the edge of the pot, spaced apart from each other, and firm then in. Water well and allow the pot to drain. Remember to label and date all your cuttings, as one soon forgets what they are! It can be useful to place the newly potted-up cuttings into a humid environment whilst they take root. A large, clear plastic lidded box (like a storage box) is an excellent humidicrib for your cuttings. Drill some holes in the bottom of the box to allow water to drain away. Another alternative is to enclose your pot of cuttings in a plastic bag. Use some sort of wire support (such as hoops made from cut-up wire coat-hangers) to stop the plastic sagging against the cuttings, and either tie the bag at the top or put the bottom of the bag over the top of the wire hoop and secure the bag with a large rubber band around the pot. Another idea is to cut the bottom off a large soft-drink bottle and place the top part of the bottle over your potted cuttings (keep the lid on at first). Not all plants need to have the high humidity provided by a propagating box, bag or bottle. Deciduous plants don't need them when they are bare of leaves. Silvery or hairy-leaved plants shouldn't ever be placed in an enclosed environment, as they are likely to rot. Leave them uncovered and in a lightly shaded position. Keep cuttings moist but not soggy. Pots or plastic boxes containing pots should be in a lightly shaded position - never direct sun at this point. Remove dead leaves and any cuttings that rot from the pots so that disease can't take hold. Ventilate the plant for a little while every so often by opening the propagating container for a short period. Once your cuttings have taken root, gradually expose them to more light and more air (if they are in an enclosed environment), and keep them well watered. 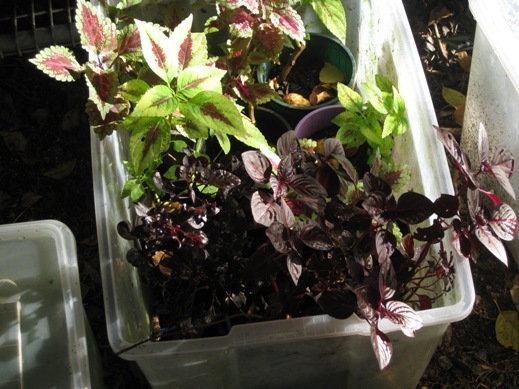 Two plastic boxes are good for this purpose, so that the cuttings that have progressed more quickly can be moved to a box that is more exposed to air by propping the lid of the box open. If you used a soft-drink bottle, you can take the bottle top off as a start to introduce them to more air, then gradually lift the bottle up so more air gets in the sides. With the plastic-bag method, lift the sides of the bag up more and more. When the plants have hardened up (i.e., are completely exposed to the air all the time) and the pot is full of roots, plant each cutting into its own individual pot, using packaged potting mix at the bottom of the pot and the propagating mix at the top. Don't do this in winter, however, when no growth is being made - wait till spring. Once they are potted on, give them regular feeds of a weak soluble fertiliser. Move them into more light. Morning sun is best for most plants at this stage. To produce a good shape, pinch out the growing tip and do this again when more side shoots form. Don't pot up into pots that are too large as there will be too much unused potting mix, which can go sour. Once they are growing well they can be moved into more sun and then planted out into the garden.